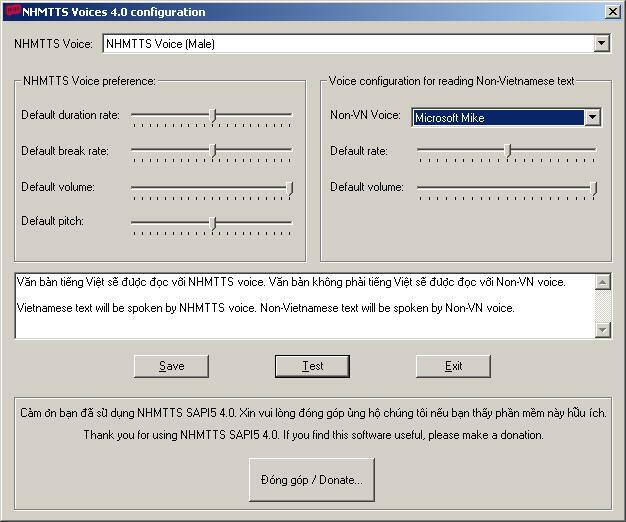 NHMTTS SAPI5 is a Vietnamese text-to-speech engine. The release of this version (4.0) includes features: - Synthesize Vietnamese speech with natural voices whose prosodics (duration, pause and amplitude) determined by a technique based on artificial neural networks. - Support SAPI5 interface. - Can work with text contain both Vietnamese and another language in Unicode format. - Provide 2 voices "NHMTTS Voice (Male)" and "NHMTTS Voice (Female)". - Allow binding another voice of non-Vietnamese language to a NHMTTS voice to support alouding text in both languages. - Allow changing default break rate, duration rate, volume and pitch of NHMTTS Voices. - Allow manipulating speech rate and volume on the fly. - Highlight text and mimic mouth shape corresponding to the sound being synthesized. - Demonstrates the engine with a simple TTSApp application. This site does not contain serial number, crack, keygen NHMTTS SAPI5 serial number : serial number is the simplest type of crack. A serial number(cdkey,product key,etc) is register the program as you may already know. a crack or keygen may contain harmful software. If you cannot find the exact version you want, just give it a try. for more information read .nfo/.txt/.diz file include in zipped file.